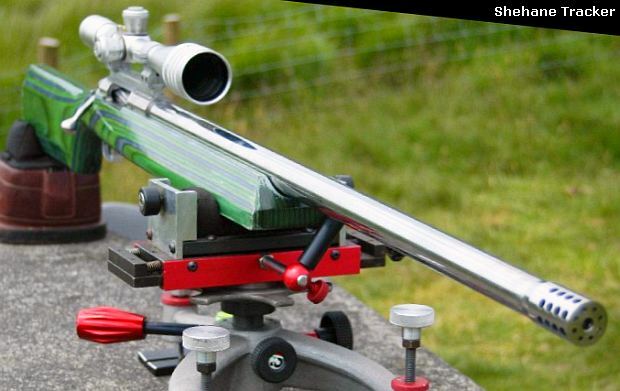 We are always pleased to showcase a talented shooter on the “other side of the Pond.” This week we present the record-setting green machine of Vince Bottomley, creator of the Precision Rifle WebZine. 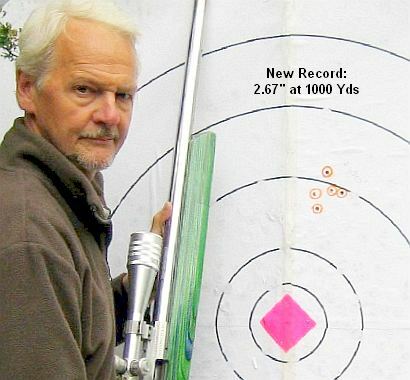 Vince shot his way into the record books with this rifle, breaking a 5-year-old UK 1000-yard, 5-shot group record. Then, a month later, he lowered his new record to 2.670″. 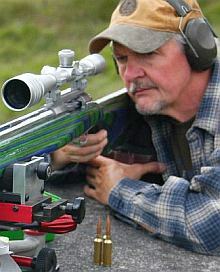 He set that mark with Norma brass, Berger 180gr VLDs, and Reloader 25. Vince’s BAT-actioned rifle started life as a 6.5-284. But after one season, he rechambered it to a 7mm WSM (a 7mm/300 WSM to be precise). The 7mm experiment was a huge success, and Vince now proudly owns the most accurate 1000-yard Light Gun in the United Kingdom. The 1000-yard point at Diggle Ranges. This is where it all happened. Click here for a desktop-sized version of this photo. The UK scene is very different to the USA when it comes to firearms and shooting. Not only are pistols and semi-auto rifles banned but we also have very few benchrest-quality gunsmiths and of course, most components come from the USA. As a result, we can wait up to a year for a new custom rifle and a 6PPC bench gun will typically cost over $5000–without scope! I came to shooting relatively late in life. I bought my first rifle only fifteen years ago but living close to a 1000-yard range meant that I soon got to shoot everything from 100 yards out to 1000 yards, including Benchrest, tactical, F-Class, classic military rifle, Highpower etc. I have been fortunate enough to be on the UK team for the last four World Benchrest Championships, though to be fair, there are so few of us in the UK that it seems we qualify with the cheque-book rather than the gun. In other words, if you can afford to go, you’re on the team! 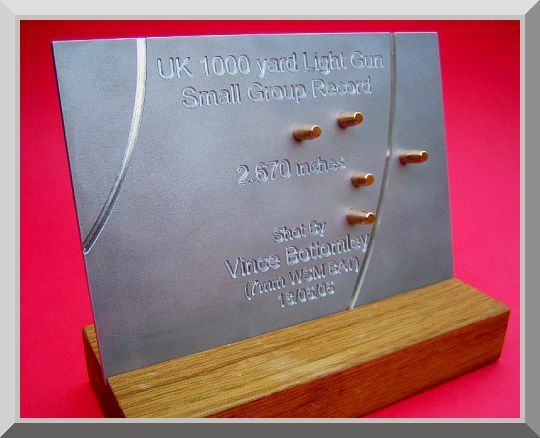 Benchrest is certainly my first love and in the UK, 1000-yard BR is now more popular than 100/200 yards. 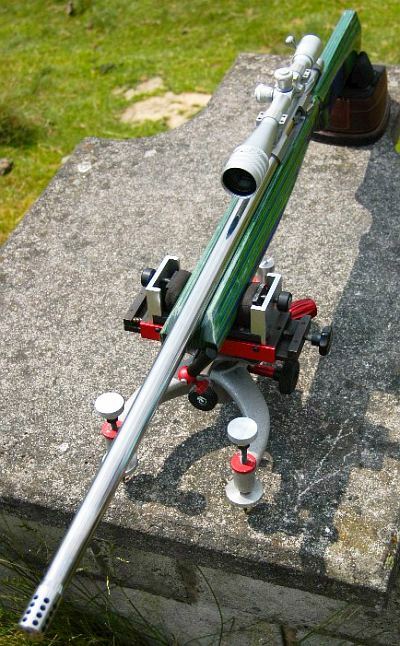 So, with my interest in the Long Range game, and the growing popularity of 1000-yard shooting in the UK, I wanted to build a rifle that was capable of winning at a major match, and perhaps challenging for a record. I wanted this to be a top-flight machine, with the best components available. 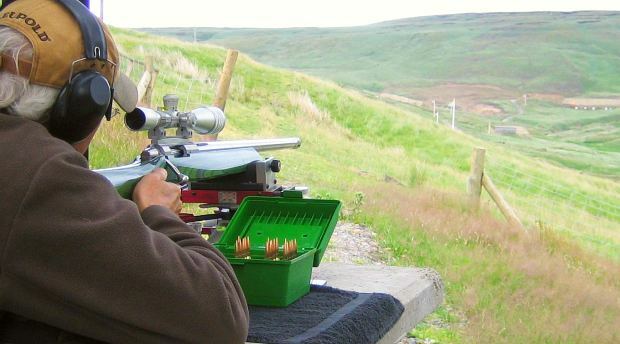 I am fortunate to live five miles from a fabulous 1000-yard, privately-owned range (Diggle) and about 15 miles from one of our top gunsmiths, Pete Walker of Walker Custom Rifles. Since I retired from civil engineering about five years ago, I’ve taken to hanging round Pete’s workshop, so when he bought a new lathe and offered me his old one–plus enough tooling to do my own barrel-work, I naturally jumped at it. Having said that, I had little prior experience of metal-working and I had never even cut a thread on a lathe, let alone chambered a barrel. Pete offered to spend a day with me when I got the lathe set up and took me through the threading and chambering process. Fascinating–I couldn’t wait to build myself a rifle! Pete swears by BAT actions, so that would be my choice and Pete ordered me a twin-port “M” action from Bruce Thom. I plumped for a ‘home-grown’ Scottish Border barrel. Since the rifle was to be a 1000-yard BR Light Gun, I decided on the 6.5-284 cartridge as I had shot this round with good success in Light Gun class for the last couple of years. Again, I took Pete’s advice and bought the reamer from Dave Kiff of Pacific Tool & Gauge, specifying a .292″ neck. The stock would be a Shehane Tracker. I had tried one belonging to another competitor and they certainly do ‘track’ well in the bags. I met Bill Shehane at Hawks Ridge a couple of years ago and you can’t do better than buy from a guy who shoots what he sells. I went for a laminate mainly because the turn-round on the McMillan fiberglass version would be twelve weeks. Bill had a laminated Tracker (ST-1000) on my doorstep in around four weeks. My Border barrel eventually arrived after a four-month wait and I couldn’t wait to spin it up in the lathe–which was sitting in my workshop gathering dust! The stainless-steel barrel-blank was 31 inches long with 1 in 8″ twist using Border’s 5R cut-rifling. Profile was a straight taper from 1.25″ down to an inch at the muzzle. My lathe has a spider-chuck at either end of the headstock spindle and I rigged up my own muzzle-flush system, having seen Pete’s Greg Tanel version. I know a lot of gunsmiths don’t use a flushing-system but it seems an obvious thing to do. Pete always chambers through the headstock and again this seemed obvious as it uses the lathe’s built-in accuracy. The lathe came with a DRO (digital read out) and I bought all new DTIs etc to set up the barrel to run within one tenth of a thousandth. It took me a good hour to do this the first time–there always seems to be one land which won’t true-up. I had a set of Bruce Thom’s notes for cutting the BAT barrel-tenon and thread and all went according to plan and surprisingly, my first thread was superb! The carbide-tipped threading tools certainly make this an easier job for the novice, as does the DRO. I also bought a copy of John Hinnant’s excellent book The Complete Illustrated Guide to Precision Rifle Barrel Fitting and found it very helpful. It is a Precision Shooting publication and I would recommend it to anyone thinking of fitting their own barrels. My reamer came with one revolving-pilot but Pete lent me a full set of pilots and showed me how to gauge the bore and select the correct pilot. 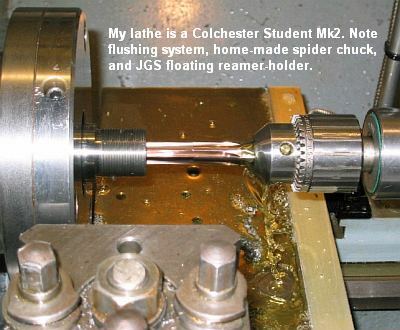 I use a JGS floating reamer-holder which mounts in the tailstock. I had previously bought a Bald Eagle hand-held one but I hadn’t the confidence to use it! With a hand on the tailstock, a hand on the half-nuts and a hand on the lathe brake–I just didn’t have enough hands to hold the reamer as well! Fortunately my first chamber cut without a hitch–barely a flicker on the DTI when I checked and a great finish when I viewed it with the borescope. Final job was to turn the barrel around and cut the crown–I opted for an eleven degree. The whole job took me about eight hours–I guess I’ll never make a living as a gunsmith! 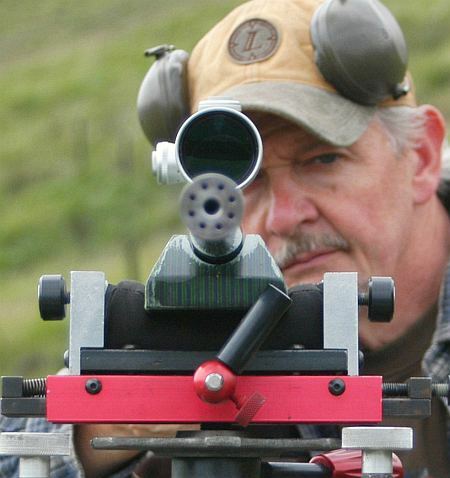 The 6.5-284 cartridge is a proven winner. Why, you may, ask, did I change from the six-five to a 7mm? Well, I did shoot the gun as a 6.5-284 for a year, but it just didn’t meet my expectations–there was too much vertical. I don’t think the problem was load development or powder. I already had developed very accurate loads for the 6.5-284 using both Reloader 22 and Vihtavuori N165 powder. Initial testing at 300 yards went well with five-shot groups around an inch. Unfortunately, the gun never ‘delivered’ at 1000 yards and I ended up with a best group over the whole 2005 season of eight inches. That won’t cut it in this game. And to add insult to injury, my old 6.5-284 bench gun, in the hands of its new owner, regularly humiliated me! The problem with the 6.5-284 was vertical stringing–I just couldn’t get rid of it. I tried a glue-in to eliminate any bedding problems. And then I re-cut the crown. But the vertical was still there. I decided something drastic would need to be done! In October 2005, I shot in the World Benchrest Championships at the Kelbly Range with another BAT-actioned rifle I built, this time in 6PPC. I got lucky and just scraped into the Top 20–my best result ever. I also arranged to pick up a 7mm Krieger 4-groove barrel and a new bolt for the BAT–with a WSM bolt-face. The “Sevens” appeared to be taking over from the 6.5s and so the plan was to re-barrel over the winter in 7mm WSM for the coming 2006 season. The 7mm Krieger would be the thirteenth barrel I had fitted–unlucky? Again Dave Kiff supplied the reamer, which was based on the necked-down 300 WSM case rather than the stock 7mm WSM, the 300 case having a slightly longer neck. The 300 WSM has a little less capacity than the factory 7mm WSM but this isn’t a problem as not all the capacity is used anyway. To be fair, Pete Walker had already sussed this out and I ordered my reamer to Pete’s drawing, with a .312″ neck. I also went for a muzzle-brake–a Vais. This is the first brake I have fitted and I am very pleased with it. The recoil-reduction is very noticeable. 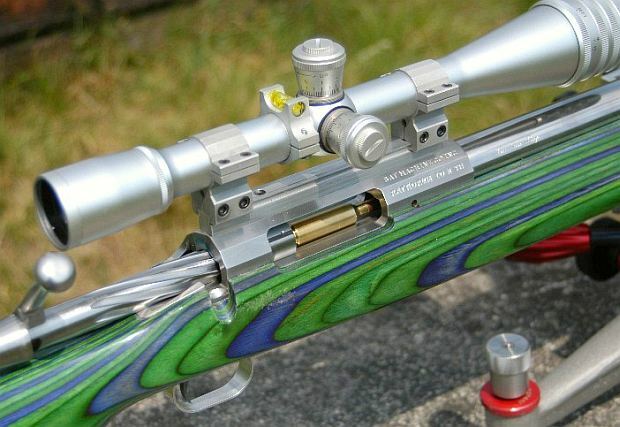 With the brake fitted, the 7mm WSM has less perceived recoil than the unbraked 6.5-284. Changing to the 7mm WSM required some careful research into components. By contrast, choosing components for a 6.5-284 is pretty straight-forward. Just buy Lapua brass, and then test the excellent bullets in the 140gr class from Berger, Lapua, Hornady, Sierra, and maybe a boutique bullet-maker such as Clinch River. In the 7mm world the situation is a little different. 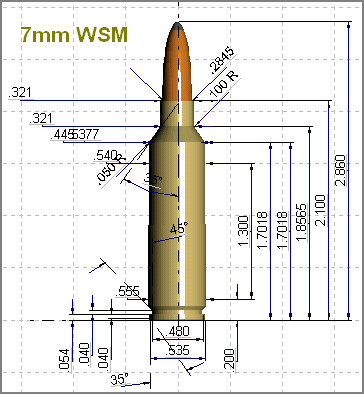 The selection of high-BC, match-grade 7mm bullets is still fairly limited, and you don’t have many choices in brass for the 7mm WSM or 300 WSM. 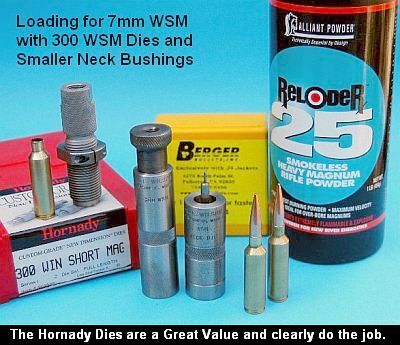 (I use 300 WSM neck-down to 7mm). Like most of us, I’m a great Lapua fan when it comes to brass but of course, they don’t produce WSMs so I selected Norma brass. Norma’s 300 WSM cases have proven to be excellent brass, very consistent in the neck-area. Cases were carefully prepped as for benchrest and turned to give 0.310 inches across the neck of a loaded round and trimmed to the same length. I don’t think it pays to go a lot tighter than this with a 1000-yard benchgun, where rounds need to be thrown in very quickly when trying to beat the wind. I don’t bother batch-weighing brass anymore. Oh how I would have loved some custom bullets such as Cauterucios, but this is the UK and it initially looked as if I would have to make do with the Sierra 175s, until a shooting buddy visiting the 2006 Shot Show brought me 500 new 180-grain Bergers! We only have a couple of dozen Light Guns in the UK and one other UK shooter, Scottish gunsmith Russ Gall, is also using the 7mm WSM in 1000-yard BR and he kindly shared his load data with me: 66 grains of Reloader 25 (RL 25). This gives an MV of just over 3000 fps. You can go higher if you want more velocity but I like easy bolt-lift for rapid shooting and my own tests left me with an accuracy load of 66.7 grains using Federal Magnum primers. This was grouping around an inch for five-shots at 300 yards, which I was happy with but I never got my MV spreads better than about 25fps over ten rounds. All my loads are weighed (as accurately as I can) on RCBS 10-10 scales. I’ve sorted and tweaked bullets many different ways in the past–measured bearing-surface length, weighed ’em, checked diameters, trimmed meplats. But this time, I thought I would see how the Bergers performed right out of the box. For neck-sizing and bullet seating, I employ Wilson 300 WSM hand dies with a .308 diameter neck bushing. This gives a fair bit of neck-tension but the reamer was designed for a Cauterucio so the Berger isn’t seated as deep as I would like. I check every loaded round with a NECO concentricity gauge and I like run-out to be no more than .001″. For a full-length body-die, I use a standard Hornady 300 WSM die but I had to turn about .040″ off the base before it would bump the shoulder. Although the dies are hardened, this is easy to do with a carbide-tipped tool. 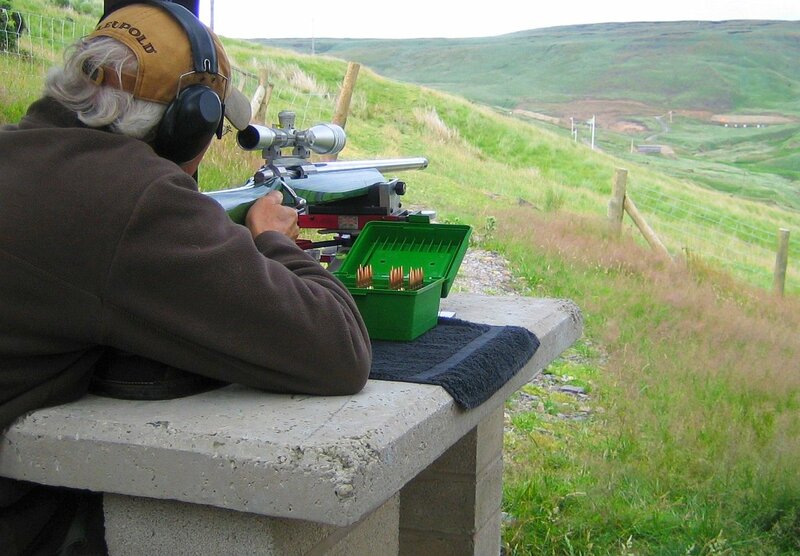 The UKBRA (United Kingdom Benchrest Association) hosts six 1000-yard matches in 2006. In the first match, I was still breaking-in the barrel and I was happy with a best group of 8″ and a 10″ Aggregate for my four groups. When it came to the second match of the series, I just couldn’t get any RL 25 powder for love or money (that’s how it is in the UK) and I tried to get the 7 WSM working with other powders. Reloader 22 (RL 22) was giving me the velocity but not the accuracy and Vihtavuori N170 was showing pressure signs at 2900 fps. I decided not to shoot it until I could get the right powder. By Round Three of the series I was still without powder when, a chance conversation with a shooting buddy, only two days before the shoot, turned up a tub of RL 25–amazingly, it was from the same batch as my original tub. We just don’t get flat-calm days at Diggle Range. We are situated 1000 feet above sea level in the Pennine hills in the north of England but, for Diggle, it wasn’t that bad a day. In the UK, we shoot two five-shot groups in the morning and another two in the afternoon and my morning groups were an encouraging ‘six’ and a ‘seven’. In the afternoon my first group was another ‘seven’ and the butts crew let me know that the first four shots were in a group under three inches. Normally, you can’t afford to shoot slowly as the wind switches so quickly but nonetheless I took a little more time to get a really precise aim and get the 36X Weaver’s crosshair exactly on the three-inch orange square in the middle of the target. At the end of the relay, the pits crew indicate everyone’s group with orange spotting-discs in the shot-holes and when my target came back up, there appeared to be just one disc in the target! Now it’s not unknown for the pits crew to play tricks but then I heard the radio–something about a new record. I still didn’t believe it though until I saw the group myself–it measured 2.866″. The previous record (which had stood since 2001) was 3.357″. Of course, “the wind blows ’em in as well as out” and sure, and I know that there’s a degree of luck in any “screamer” group. I just hoped it would be a few years before anyone else got that lucky and broke my record! I didn’t have to wait long. At the very next 1K match (the following month) the 1000-yard record was broken again–fortunately by me! It now stands at 2.670″. Yes, I know we are behind Rich DeSimone’s 1.59″ record, but considering how few of us shoot long range in the UK, at least we are progressing in the right direction! I know Rich is a former 100-yard BR shooter and he, like me, must have shot a ‘screamer’ at both 100 and 1000 yards. Just one other UK shooter, besides myself, has done that. In closing, I must thank my mentor, Pete Walker of Walker Custom Rifles who taught me what little I know about the art of gunsmithing. I also thank all those who make such fine products for us–namely Bill Shehane, Dave Kiff, Berger, Norma, Krieger Barrels, BAT Machine, Weaver, Jewell–and the shooters who generously share their knowledge through sites such as AccurateShooter.com | 6mmBR.com. Copyright © 2010, AccurateShooter.com | 6mmBR.com, All Rights Reserved. Topics: United Kingdom, UKBRA, UK, Vince Bottomley, Dingle Ranges, Pete Walker, Walker Custom Rifles, Greg Tanel, Heavy Gun, Light Gun, BAT Machines, Border Barrels, Krieger Barrels, Shehane, Tracker, ST-1000, Rutland Laminate, Laminated, Seven Millimeter, 7mm, 7 WSM, WSM, 6.5-284, Norma brass, Berger Bullets, Match, 6mm, 6mm BR, 6BR, 6.5-284, .284, F-Class, 1000 yards, 1K, IBS, NBRSA, 300m, 800m, Varmint, Varminting, Jewell trigger, Benchrest, BR, Bench Rest, Single-shot, competition, rifle accuracy, Alliant, Reloader 25, RL 25, Vihtavuori N165, CCI BR4, Alliant, Berger, Dave Kiff, Pacific Tool & Gauge, JGS, Lathe, stocks, Weaver, Wilson Die.